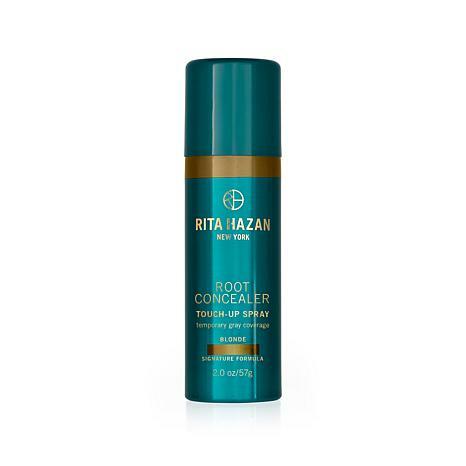 An award-winning root touch-up spray designed to conceal gray roots in seconds and keep them covered until shampooed out. The pinpoint actuator helps you apply color exactly where it's needed. With a custom, blended dye, this spray is buildable to work with various hair colors. Very quick and easy to use. Goes on without a mess on your clothes, furniture, mirror or face. Dries very quickly and blends in the white hair into my blonde hair. I ordered the black. My roots are white and this covers well. Works as described on air. I ordered this because I want to grow my natural color out. This small can wont be enough for that, but if you need a quick cover job in a pinch, it works. Also, if you scratch an itch on your head the color will be under you fingernail. Cant be without product...color match is spot on...extends salon color appointments...avoid grey showing around face...easy to use nozzle for application!